I cannot believe my last trip report was posted way back in October 2013 on the Family affair in the Kgalagadi Transfrontier Park. So I am due to post another trip report. So let us go to another part of South Africa – this time well known to the rest of the world. 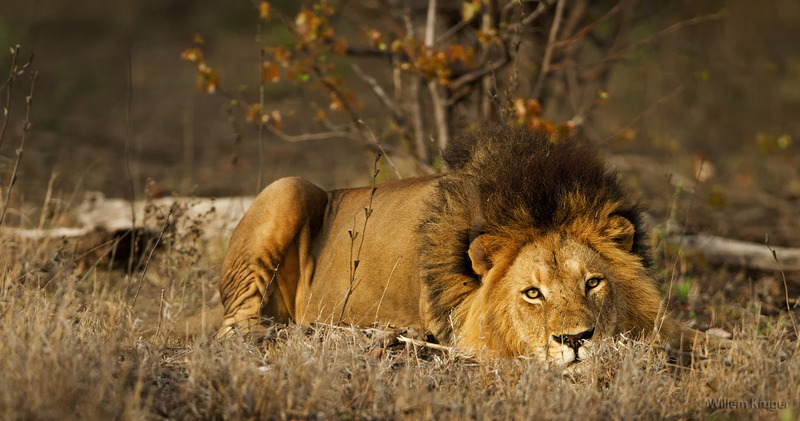 This trip report is on my visit to the northern part of the Kruger National Park. We stayed the first night in Louis Trichardt and entered the park early on Sunday morning via Punda Maria gate. As with all my other trip report, I’ll let the photos tell the stories theme by theme and not day by day. My previous visit to the Kruger park was a few years ago – before I became interested in photography. So I only had a point-and-shoot camera at that stage and I did not like photography that much. So this time around it was different as my equipment consisted of a Nikon D3S & Nikon D800 camera, 600mm, 200-400mm, 70-200mm, & 17-24mm & 105mm macro lenses, and a Nikon 1.4 convertor. I did not really have high expectations before the trip because I was not familiar with the environment and circumstances and I did not know what to expect – unlike the Kgalagadi. But after all – I was very impressed with the images I got although I came home with only about 2500 images after being almost 2 weeks in the park. Totally different from the Kgalagadi – after three weeks in the Kgalagadi (just after this Kruger Park trip) I came home with about 11 000 images. Nikon D800 camera with 105mm macro lens, ISO100, 1.3 sec, f22, exposure comp = +0.3, Aperture priority, WB = sun. 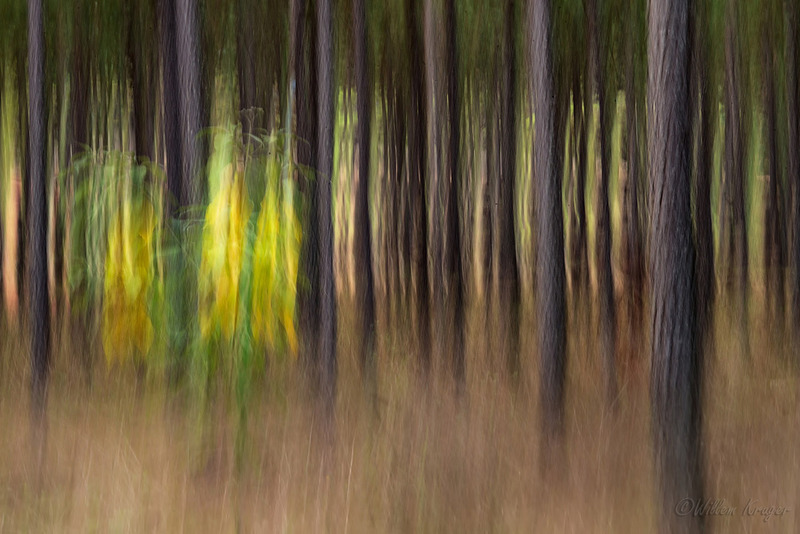 Nikon D800 camera with 105mm macro lens, ISO100, 1 sec, f32, exposure comp = -0.7, Aperture priority, WB = sun. 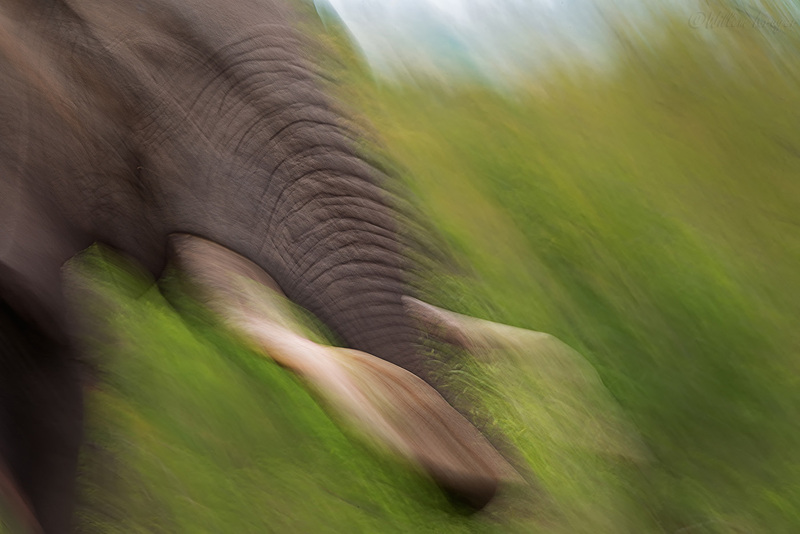 And another abstract photo – this time of an elephant. We came across this elephant bull near Punda Maria camp late one afternoon and because of the low light conditions, my shutter speed was automatically very low – almost by accident and I got it even lower with an f-stop of 32. Nikon D800 camera with 200-400mm lens @ 200mm, ISO100, 1/2 sec, f32, exposure comp = +1., Aperture priority, WB = sun. For a day or two we did not have great photographic sighting and we were just enjoying ourselves in the park environment (just being in the park). 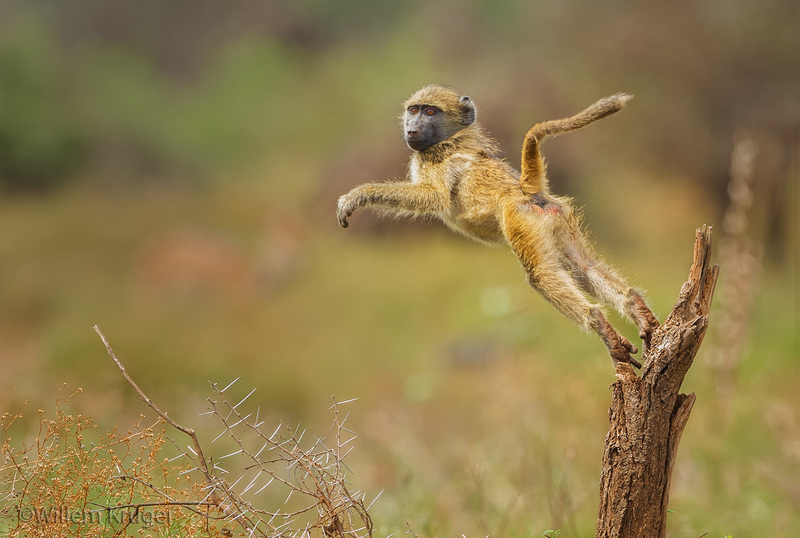 Near Crookes corner we came upon a group of baboons and this small one took a leap of faith over the thorns below him. It was overcast and I had to increase my ISO to get a decent shutter speed. Nikon D3S camera with 600mmf4 lens, ISO1600, 1/1250 sec, f8, exposure comp = +0.67, Aperture priority, WB = sun. 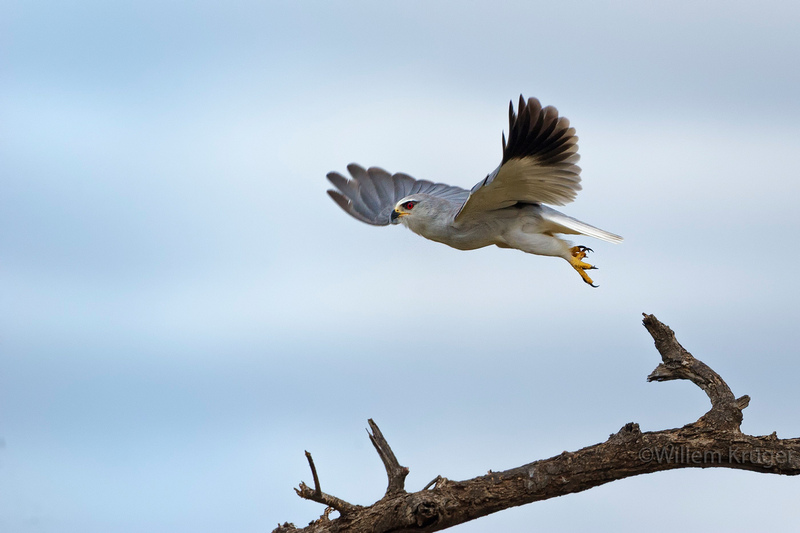 Almost at the same spot we saw a Black shoulder kite ready to take off – we waited and were not disappointed. However, the action happened a bit far from us resulting in a heavily cropped image. Nikon D3S camera with 600mmf4 lens, ISO1250, 1/3200 sec, f8, exposure comp = 0, Aperture priority, WB = sun. It looks like Crookes corner is the place to be for watching raptors and vultures. A lot of vultures are breeding in the top of the trees along the river. We saw a few Africa fish eagles as well and the yellow bill kites, as always, on the lookout an easy piece of food. 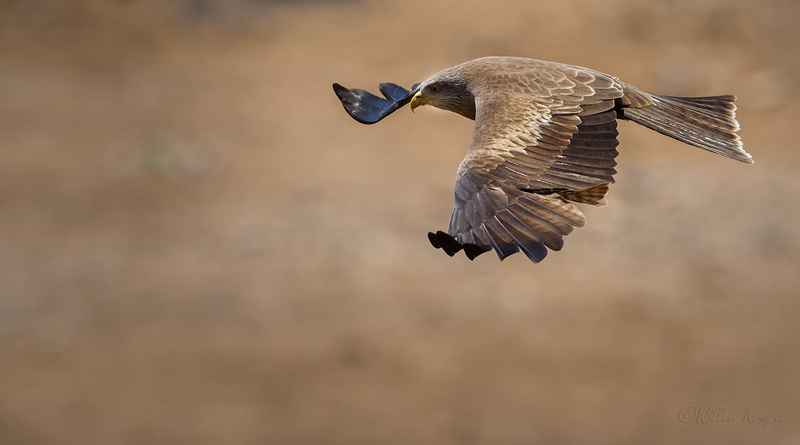 Below is a yellow bill kite flying over the river doing exactly that. Nikon D3S camera with 600mmf4 lens, ISO800, 1/5000 sec, f4, exposure comp = 0, Aperture priority, WB = sun. Nikon D3S camera with 600mmf4 lens, ISO1000, 1/1600 sec, f8, exposure comp = -0.33, Aperture priority, WB = sun. Nikon D3S camera with 600mmf4 lens, ISO4000, 1/3200 sec, f4, exposure comp = -0, Aperture priority, WB = sun. Nikon D3S camera with 600mmf4 lens, ISO2500, 1/8000 sec, f5, exposure comp = 0, Aperture priority, WB = sun. These guys are so quick I had to get a shutter speed of 1/8000 to get a sharp image of this one. And that means I had to increase my ISO to 2500. 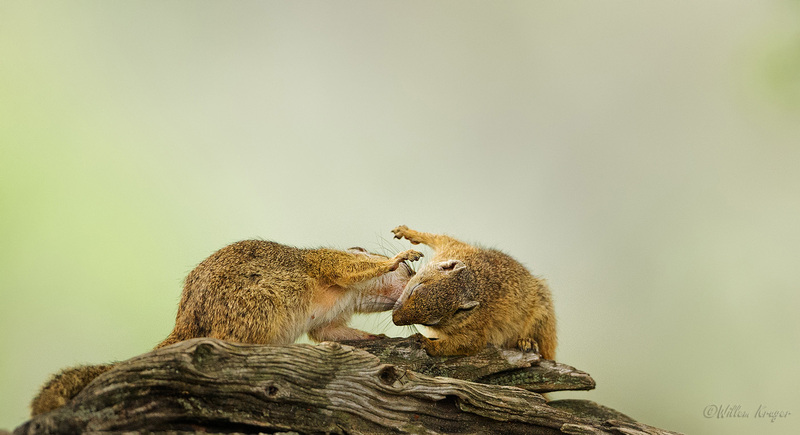 Luckily it is small animal and I decided that f5 would do the trick for me – and it did. 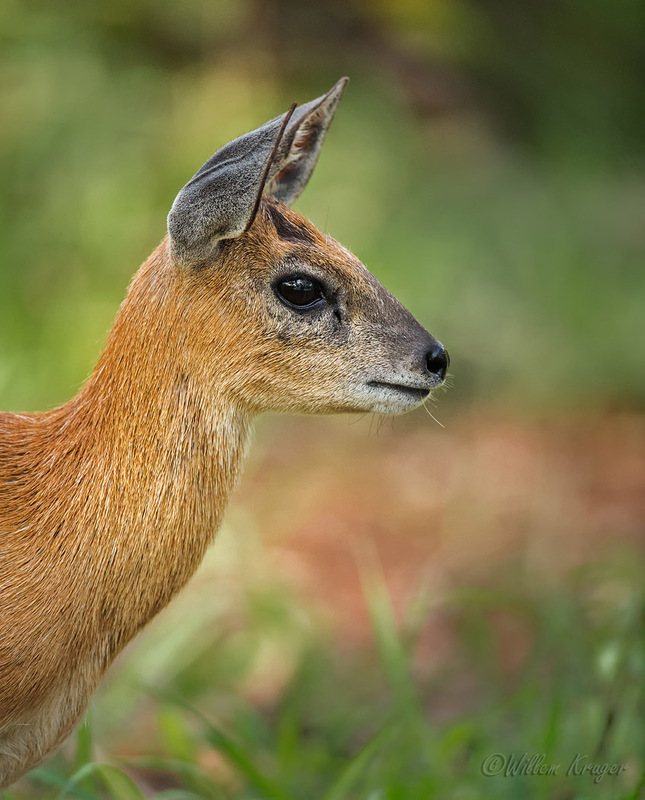 We’ve spend a lot of time watching these little creatures running around near the bridge over the Luvuvhu River. And these two love ones were just around the corner from the Punda Maria camp enjoying themselves after a hard day’s work foraging. Nikon D3S camera with 600mmf4 lens, ISO4000, 1/3200 sec, f4, exposure comp = +0.3, Aperture priority, WB = sun. Almost every morning we drove the 50km+ from Punda Maria to the Pafuri area and back. And we were not disappointed with the sightings in this area. However, getting good quality shots were hard to come by and I had to work hard to some decent images. But that did not bother me as I was enjoying myself. Here are few examples of images taken on your way to the Pafuri area. 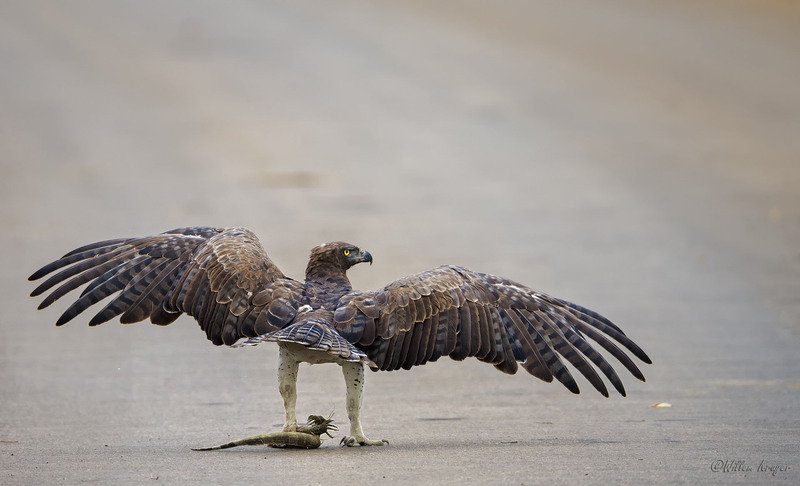 One morning we were very fortunate to come across a martial eagle that has caught and killed a water monitor. The eagle was sitting in the middle of the tarred road and it struggled to take off with the monitor in its claws. It was great to watch the eagle struggling and eventually took off. I could not get a great image because of the angle – the eagle moved away from use – but I am pretty satisfied with what I got. Nikon D3S camera with 600mmf4 lens, ISO1600, 1/1250 sec, f4.5, exposure comp = +0.67, Aperture priority, WB = sun. Nikon D3S camera with 600mmf4 lens, ISO1250, 1/3200 sec, f4, exposure comp = -0.33, Aperture priority, WB = sun. As you can see – I do try and keep my shutter speed relative high all the time (around 1/1600 to 1/3200 sec) even with stationary animals. I do not want to be surprise by a fast reaction/action from the animal with my camera setting on a slow shutter speed. And then there were the ever-present buffalos – so I’ve tried something different when one buffalo emerged from the herd while the rest were creating some great dust clouds. And the rest of the trip report will follow at a later stage. As you can see from this trip report and my images, I’ve tried to move away from the usual Kruger park images you are so familiar with. Why? I am sure you have reached a point where all your photos start to look the same. Well, when I look at all the other images for other photographers coming back from the Kruger park, they almost look the same to me. And I am afraid I’ll go the same route. That feeling makes me think about taking photos in the Kruger park and I thought to myself: Do I feel uninspired going to the Kruger park? I’ve never been to the Kruger park since I became seriously interested in photography (end of 2010). Feeling uninspired happens to every photographer every now and then. It is kind of like a writer’s block. As photographers become too comfortable with how we take photos, they tend to get into a routine and everything starts to look the same. This is why it’s important for real photographers (called artists) to break out and think outside the box. That forces you to look for alternative images to show to the world and I hope I’ve achieved some of these objectives with this trip report. 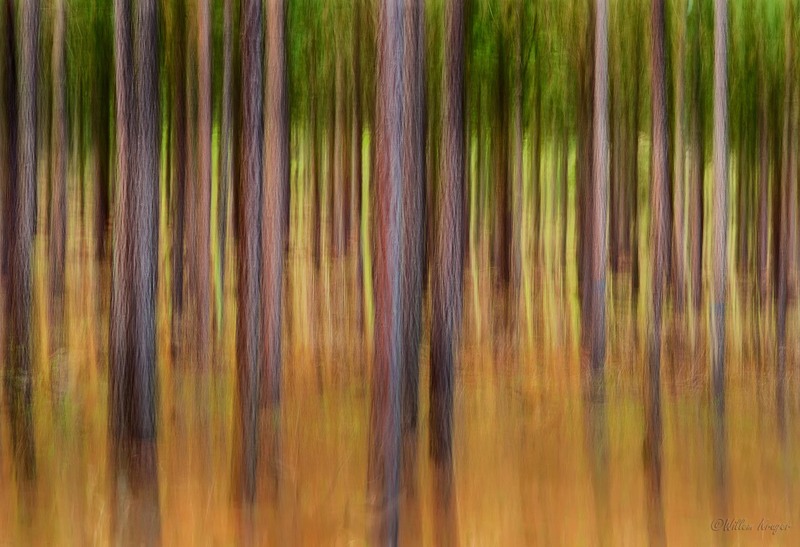 Until my next trip report, keep on shooting but think outside the box while taking alternative photos. This entry was posted on February 3, 2014, 6:27 pm and is filed under Trip reports. You can follow any responses to this entry through RSS 2.0. You can leave a response, or trackback from your own site. Now this is a trip report I’ve really been looking forward to, and you did not disappoint Willem! I can’t wait for the next installment. I absolutely agree with your comments about the sightings around Punda Maria and Pafuri. We’ve never been disappointed – our last visit to the area was in September last year and we’re actually heading that way again next week. There’s always something interesting to see – the unique birdlife and chance of encountering rare antelope are big drawcards for us. There’s few places as beautiful as Pafuri’s riverine forests, and best of all you don’t have to jostle with a crowd of people at every sighting. Hi de Wets – thanks for the comment and if I had to go back, it would be again to that areas. Hi Willem, hou baie van die fotos. Veral die idee van iets anders afneem en anders afneem. 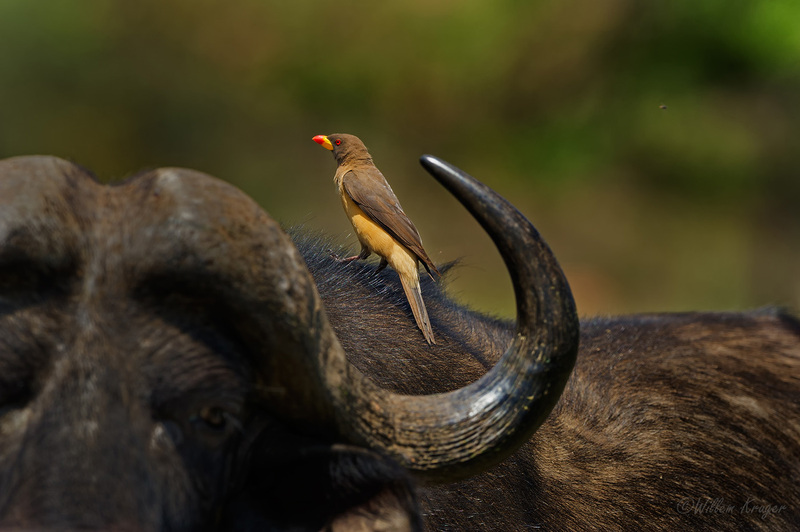 Het jy die buffel so “skoon geneem”, (1 foto), of het jy iets gedoe om die buffel uit te sonder van die stof en die res? Hi Jan – thanks vir die comment. Yes, ek het die buffel skoon afgeneem. 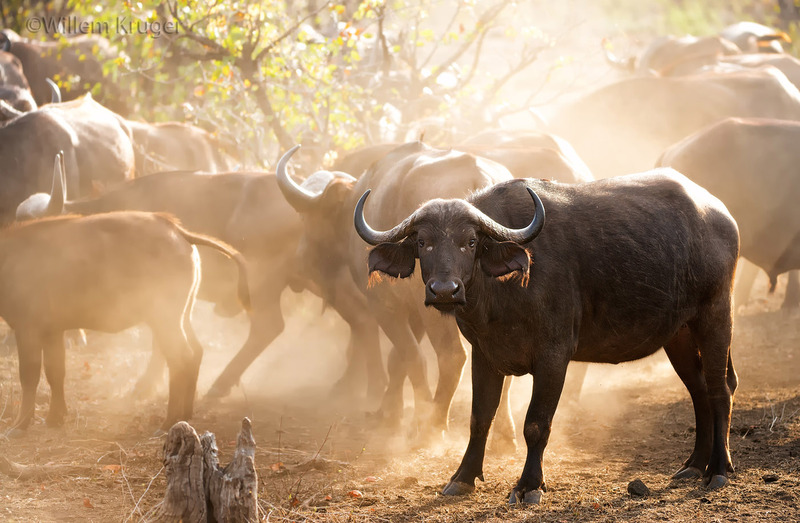 Ek het gewag totdat een buffel uit die trop beweeg het – nadat die res van die trop lekker stof opgeskop het. Weereens gaan dit oor geduld en wag vir interessants om te gebeur. Pragtige foto’s Willem en beslis klop op die skouer werd! Baie dankie Christa – bly jy het dit geniet.